Photo and text edited 09/07/15 to read "line for putting" and not "line of putt"
A few weeks ago, when I blogged about the Aimpoint green reading system, I commented on players walking on and close to their line of putt. This week, I want to highlight the fact that purposely touching the line of putt and pointing to the line of putt can both incur a penalty. So, it follows that in pointing out a line for putting, a player may not touch the putting surface with their finger, the toe of their shoe, their putter, the flagstick, or anything else. They may point to the suggested line, but they must not touch the surface of the putting green while doing so. (vii) in removing movable obstructions - Rule 24-1. Even if you receive my weekly blogs on the Rules by email, you should still bookmark my blog page on your smart phone or tablet. Then you can catch up with any issues that you may have missed, while you are on the train, waiting at a bus-stop, in the dentist’s waiting room, having a quiet coffee, relaxing on the beach, arguing in the Clubhouse, etc.. I don't understand why 'pointing to the line of putt can incur a penalty', unless it is done during the stroke, which seems a bit pointless as it is too late anyway. I don't belief that the dotted line in your diagram is a "line of putt". It certainly is a "line for putting". These are two separate things. Of course you are correct. I have noe edited the photo text to match the content. Thanks for spotting this. Rule 8-2b does not permit a mark to be placed anywhere to indicate a line for putting, so it follows that a caddie or fellow competitor may not achieve the same result by using the toe of their shoe or the end of a flagstick to point to the line. Sorry, I don't understand. Why is pointing at something, without touching it, the same as touching it? Likewise, pointing at something is not the same as placing a mark. 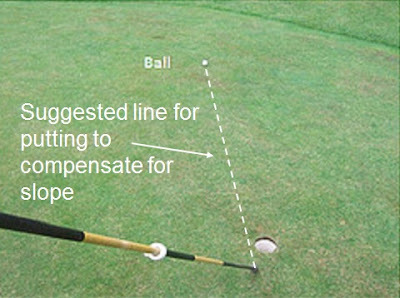 "However, fewer golfers seem aware that they must not touch anywhere on the surface of the putting green while pointing out a suggested line for putting,..."
Pointing to the line for putting without touching the putting green does not incur a penalty! Def of Line of putt states the line does not extend beyond the hole, so the flag wouldnt be touching the line would it? There is a subtle difference between 'line of putt' and 'line for putting'. Re-read my blog and note that it is Rule 8-2b that prohibits a player from touching the putting green anywhere while pointing out a line for putting. Can a player use his/her putter to remove loose impediments (e.g. push a leaf away)on their intended line to putt... i didnt think so, but I sure see a lot of people doing it... versus bending over and picking it up. Decision 23-1/1 confirms that loose impediments may be removed by any means, providing that in removing loose impediments on the line of putt, the player must not press anything down. In my blog dated 2 September 2014 I point out that a player may even carry a brush in their bag for this purpose..... but don't!